Cleveland pear trees or Chanticleer pear trees (Pyrus calleryana Chanticleer) feature fragrant white blossoms in April or May. The trees grow in hardiness zones 5 to 8 and are generally quite hardy, according to Arbor Day Foundation. Cleveland pear trees are fairly disease resistant, so leaf yellowing can puzzle novice and experienced gardeners. Cleveland pear trees (and many other yard trees) can develop yellow leaves for a number of reasons. If the leaves on your Cleveland pear tree yellow, it's a clear sign that something is wrong with the tree. Cleveland pear tree leaves remain a bright green from the spring to the early autumn. They do not turn yellow in autumn, changing instead to hues of orange, reddish-gold and purple. If your Cleveland pear tree appears to show reduced vigor or no new growth, has leaves that also turn brown and fall off, or shows dead branches, the yellow leaves may be one of many signs that your tree is dying from root rot. Cleveland pear trees that are planted in boggy soil or that receive too much water can contract root rot when their roots stand in water all the time. The major symptoms of this disease occur below the ground but some--including leaf yellowing--occur above ground. This disease cannot be cured. As Oklahoma Department of Forestry notes, other root damage can cause a tree to develop yellow leaves. Tree trunks and root systems that get damaged during harsh winters or injured by accident (with a lawnmower, for example) can also cause leaf yellowing. Give your Cleveland pear a wide berth when mowing and mulch around the trunk to help protect your tree from winter frost injury. Ornamental pear trees like Bradford and Cleveland can develop yellow leaves as a result of soil deficiencies, note both New Mexico State University and the Oklahoma Department of Forestry. One common disease is called chlorosis, and it occurs in non-acidic growing environments and in over-watered soils. Chlorosis is an iron deficiency; adding acid can correct the problem. Excess salt can also cause leaf yellowing; this occurs if you water the pear tree with salty water and can be corrected by watering with distilled water. Call your county extension officer to arrange a soil test to determine whether you have a soil problem that's affecting your trees. An extension officer can test your soil, diagnose your tree, and tell you what to do to correct the problem. Any type of tree--including the Cleveland pear--shows signs of stress if it's growing in a poor environment. If the leaves appear yellow and shriveled, your Cleveland pear tree may not be getting enough water. Correct your irrigation to see if this helps the leaves return to healthy color and texture. Try adding 1 inch of water per week unless you receive adequate rainfall. Cleveland pear trees planted in windy environments may also develop yellow and brown splotching in periods of hot, dry wind. This is called leaf scorch and can also be prevented with adequate watering. Keep your Cleveland pear tree healthy by providing adequate care year-round. The trees benefit from 1 inch of irrigation per week, and from annual pruning to remove dead, diseased and unhealthy branches. Prune after the tree flowers, in late spring. 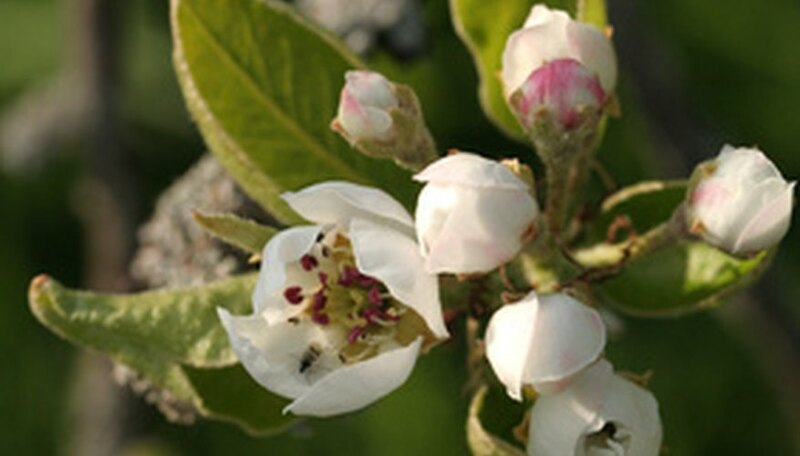 Cleveland pear trees should be fertilized with a slow-release fertilizer to promote health and growth. Apply the manufacturer's recommended dose in the spring based on your tree's trunk size. Oklahoma Department of Forestry: Why Do My Trees Have Yellow Leaves?